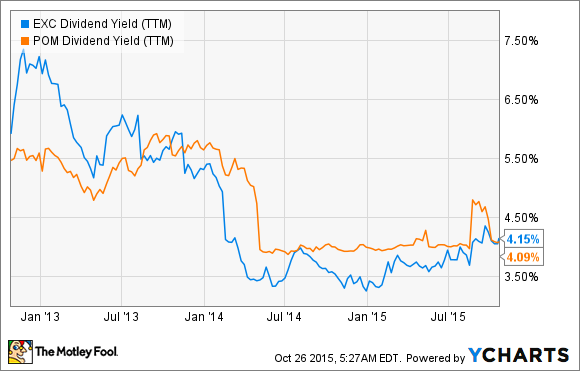 Dividend investors rejoice, but is bigger actually better? Exelon Corporation (NYSE: EXC) is one of the biggest utilities in America, but it wants to get even bigger. With the proposed addition of Pepco Holdings, (NYSE: POM), could this $26.7 billion stock with an astonishing 4.1% dividend yield be ready for more growth than ever? Here's what you need to know. In 1935, bigger wasn't considered better. The Public Utility Holding Company Act of 1935 limited growth, restricting utilities to specific states. But 70 years later, the Energy Policy Act of 2005 repealed many of the old regulation's restrictions, opening up merger opportunities across America. Exelon already merged once—with Constellation Energy in 2012 —and now it wants to get bigger again. Last April, Exelon approached regulators with a proposition to purchase Pepco Holdings for $6.8 billion in cash. The merger would combine Exelon's 6.7 million customers with Pepco Holdings,'s 1.9 million, making it the largest utility (by customers) in the United States. At the time of the proposal, Exelon President and CEO Chris Cane noted that the two utilities "have a compelling strategic rationale for merging, given our geographic proximity and similar utility business models ." For Exelon, the addition would increase its regulated holdings, an important balance to strike as power prices recover. With federal regulators on board and some of the staunchest critics starting to warm to the idea (Washington D.C. will likely give the thumbs up now that the companies have agreed to locate their headquarters in our nation's capital), it seems as if the merger will make it. The decision likely won't be made until early 2016, but investors need to know now whether this merger will make a dividend stock worthy of their portfolios. Over the last three years, Exelon stock and Pepco stock have both underperformed the S&P 500 (SNPINDEX: ^GSPC), by 13 percentage points and 63 percentage points, respectively. In that same period, Exelon cut its dividend by 40 % and Pepco kept its own steady as their dividend yields grew and shrunk in inverse relation to each company's stock. Today, Exelon Corporation's dividend yield (TTM) sits at 4.15%, while Pepco Holdings,'s clocks in just below at 4.1%. With the average electric utility dividend yield currently sitting at 3.5 %, a merger of these two stocks seems simply superb. But every investment opportunity is relative. Duke Energy Corporation (NYSE: DUK), presently America's largest utility by customers, sports a 4.5 % dividend yield and has increased its payout three times over the past three years for a steady overall 8% increase . To dive a bit deeper into which dividend might be worth it, let's take a look at payout ratios and debt. Payout ratios tell us what percentage of a company earnings goes straight to dividends, giving investors an idea of whether a stock may be overambitious or over-conservative with its distributions. Currently, Duke is using up nearly all its earnings to distribute dividends. Exelon Corporation, with its competitive arm, is more conservative with its distributions, saving over 40% of its earnings for other purposes. And Pepco Holdings has overextended itself, creating ample opportunity to smooth out its ratio with Exelon's extra wiggle room. Debt is an important part of every utilities' portfolio, and their debt-to-assets ratio shows us how aggressive each stock is with its debt. 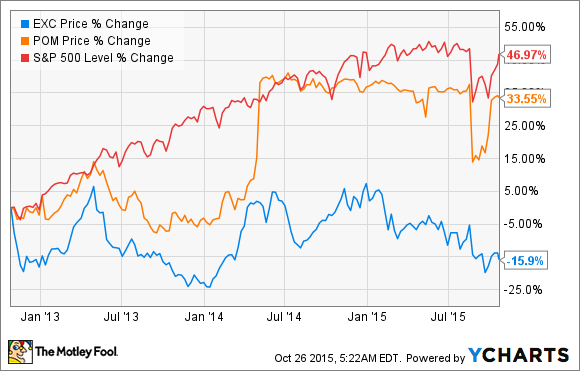 For these three stocks, there isn't too much difference. However, just as with payout ratios, Duke has taken on more debt than Exelon, and Pepco Holdings is the most aggressive of them all. Is this merger worth it? Exelon Corporation and Pepco Holdings are the yin and yang to Duke Corporation's zen middle-ground. The proposed merger would even out the two companies' payout ratios, debt-to-asset ratios, and make them the biggest utility around. But despite the claims of cut costs and improved efficiency, mergers can be a major headache for investors. Utilities' business models rely on scale, but the relative attractiveness of Duke's current yield and current ratios makes it tough to pass up this comparable dividend stock. Whatever the choice, dividend stock investors should practice due diligence before jumping into a merger opportunity. Only by digging deeper into dividend fundamentals and comparing the competition can an investing thesis truly divulge dividend dynamite.